Annual bluegrass weevil adults resistant to pyrethroids show resistance to or increased tolerance of insecticides from several other insecticide classes. Jan 2019 | Olga S. Kostromytska, Ph.D.; Shaohui Wu, Ph.D.; and Albrecht M. Koppenhöfer, Ph.D. The annual bluegrass weevil (ABW), Listronotus maculicollis, is a serious and expanding pest of golf course turf in the Northeast and Mid-Atlantic regions of the United States and in southeastern Canada. ABW larvae can cause severe damage to tees, fairways, collars and greens. ABW is one of the most difficult turfgrass insect pests to manage in North America because several generations are present in a single year and multiple life stages are present concurrently (and with increasing asynchrony) during the growing season (3). Chemical control has been an important strategy in ABW management. In the 1980s, pyrethroids started to be widely used because they can effectively control ABW adults, thereby preventing oviposition and subsequent damage. As a result of excessive pyrethroid use, many courses started to observe a decrease in the efficacy of this strategy by the 2000s. Resistance to pyrethroids was first reported from southern New England (5). In a recent survey of the area affected by ABW, insecticide-resistant ABW populations were thought to be present on 19% of participating golf courses across the area and, more regionally, on up to 55% of courses on Long Island, N.Y. (4). The only adulticide available as an alternative to pyrethroids is chlorpyrifos (Chlorpyrifos, multiple manufacturers), an organophosphate that is less effective than pyrethroids (1, 2) and is troublesome from a toxicological and environmental standpoint. All other alternatives are larvicides, including the diamides chlorantraniliprole (Acelepryn, Syngenta) and cyantraniliprole (Ference, Syngenta), the spinosyn spinosad (Conserve and MatchPoint, Dow AgroSciences), the oxadiazine indoxacarb (Provaunt, Syngenta), and the organophosphate trichlorfon (Dylox, Bayer) (1). However, according to field studies, the efficacy of most insecticides against pyrethroid-resistant ABW populations seems to be reduced (1, 2). This is not surprising, as pyrethroid resistance in ABW seems to be, at least in part, due to enhanced enzymatic detoxification (6), a rather nonspecific mechanism that breaks down active ingredients before they can reach their target sites in the organism. Efforts continue in the development of more sustainable management practices, such as plant resistance, biological control and improved ABW monitoring. Meanwhile, careful measures need to be taken to prevent the development of resistance to new chemistries and to synthetic insecticides in new populations, and to effectively manage already-resistant populations. Hence, the main goals of our study were to determine the degree and scope of ABW resistance, determine existing cross-resistance patterns, and confirm laboratory observations under more realistic greenhouse conditions. Adult ABWs were collected from populations at different golf courses in New Jersey, eastern Pennsylvania, southeastern New York and southwestern Connecticut during 2014 and 2015. 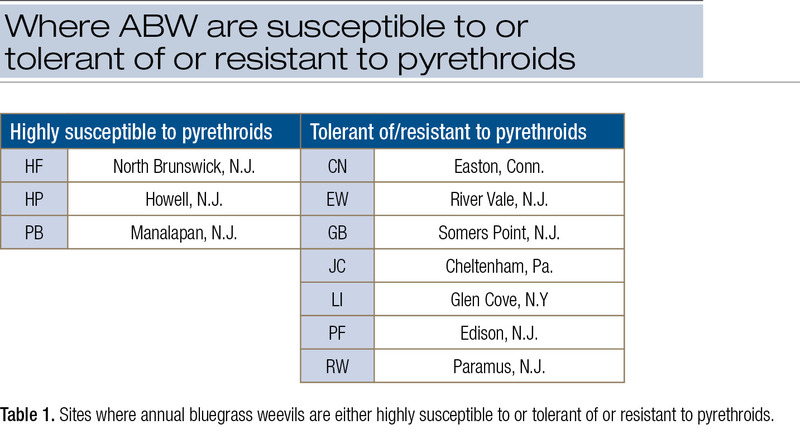 Based on a preliminary petri dish test and consistently decreased pyrethroid efficacy as observed by the superintendents of the respective golf courses, the populations appeared to be highly susceptible to pyrethroids at three collection sites and tolerant of or resistant to pyrethroids at various levels at seven sites (see Table 1). Adults from the overwintering generation were collected from overwintering sites on golf courses around late October. For two to six months, they were kept in containers on moist sand in an incubator (10 hours light at 43 F [6 C]: 14 hours dark at 39 F [4 C]). Overwintered (collected around late April) and spring-generation (collected around early July) adults were collected from fairways or greens. Before being used in experiments, adults were kept in containers on moist sand in incubators (14 hours light at 72 F [22 C]: 10 hours dark at 57 F [14 C]) for at least one week and provided with cutworm diet and annual bluegrass (Poa annua) clippings as food. Technical-grade active ingredients (a.i.) 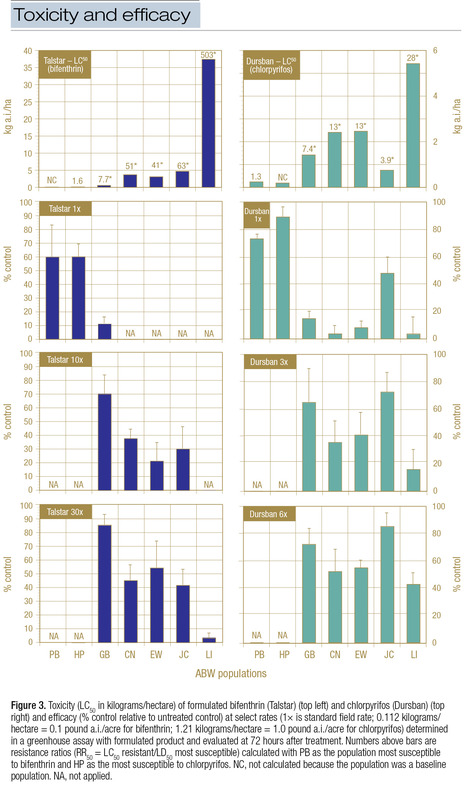 (> 95% purity) of insecticides from six chemical classes with different modes of action (Table 2) were dissolved in acetone to be used in topical and feeding assays. In the greenhouse trial, the formulated commercially available products Talstar Pro (a.i. bifenthrin, FMC), a pyrethroid, and Dursban 50W (a.i. chlorpyrifos, Dow AgroSciences), an organophosphate, were used. Topical bioassays with technical-grade active ingredients dissolved in acetone were conducted to determine adult susceptibility to the major insecticide classes used for ABW control. Two susceptible populations (HF, PB) and the seven resistant populations were tested. Based on preliminary testing, six concentrations per active ingredient were selected for each population. Overwintering generation adults were treated with 1 microliter pure acetone or insecticide solution applied dorsally to the intersegmental membrane between the prothorax and the elytra with a syringe connected to a microapplicator. Treated adults were placed in petri dishes (3.5 inches [9 cm] in diameter) lined with one moistened (1 milliliter tap water/dish) filter paper (10 weevils/dish). Poa annua (three sprigs) was provided as food. Dishes were placed in an incubator (16 hours light at 70 F [21 C]: 8 hours dark at 57 F [14 C]). For each dose of each active ingredient, there were two dishes with males and two with females. Mortality was evaluated at 24, 48 and 72 hours after treatment. Weevils were considered dead if no movement was observed after probing. Adults from the HF population and the PB (LD50 0.005) and HP (LD50 0.011) populations were highly susceptible to bifenthrin. No control failures have been reported from these three locations, where frequency of pesticide applications was relatively low. Therefore, these populations were used for susceptible contrast in most of our assays to calculate resistance ratios. Adults from all other locations, where difficulties in controlling ABW with synthetic insecticides had been reported, demonstrated moderate to high levels of resistance to bifenthrin, ranging from an RR50 of 31 (GB) to an RR50 of 343 (LI). The LD50s for λ-cyhalothrin (0.001-0.363 microgram/insect) were, on average, about half of those for bifenthrin and followed a very similar pattern with respect to resistance levels (RR50s = 18-324) (Figure 1). The populations that showed resistance to bifenthrin also had significantly higher LD50s for chlorpyrifos (RR50 range = 3.3-15.3), spinosad (RR50 range = 2.5-7.7) and clothianidin (RR50 range = 4.2-9.7) compared with the most susceptible population (Figure 1). However, the RR50s were much lower than for the pyrethroids. The LI population also was clearly the least susceptible to chlorpyrifos and spinosad, but for populations at the other locations, the ranking of resistance levels followed a pattern different from that for the pyrethroids. Mortality from indoxacarb and chlorantraniliprole in the topical assays was too low (≤20%) to allow calculation of LD50s. Therefore, feeding assays were conducted to determine resistance levels of ABW populations to these active ingredients. Clothianidin is systemic and has demonstrated higher toxicity if ingested. Therefore, clothianidin, which showed relatively low toxicity in the topical assay, was also included in the feeding assays. Two susceptible (HP, PB) and five resistant (GB, CN, EW, JC, LI) populations were tested. A small disc (0.16 inch [4 mm] diameter, 0.04 inch [1 mm] thick) prepared from cutworm diet was placed in the middle of each petri dish (3.5 inches [9 cm] diameter) lined with one moistened (1 milliliter tap water/dish) filter paper. Diet discs were treated with 10 microliters of acetone or active ingredient solution in acetone. Ten adults starved for 24 hours prior to assays were introduced per dish. There were three dishes for each of five concentrations (ranging from 0.1 to 30 milligrams a.i./milliliter) of each insecticide for each ABW population. Mortality was assessed at 24, 48 and 72 hours after weevil introduction. In the feeding assay, chlorantraniliprole was not toxic enough to cause significant ABW mortality even at the highest rates, and the data were thus not presented. 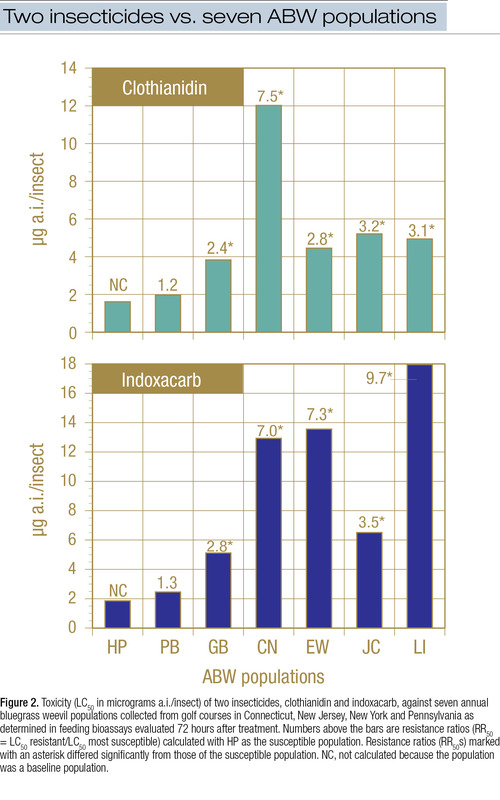 Pyrethroid-resistant populations showed significantly increased tolerance to indoxacarb, with the highest RR50 for LI (9.7) and the lowest for GB (2.8) (Figure 2). Toxicity of clothianidin was similar to that observed in the topical assay, except that the LC50s at the most susceptible (PB) and most tolerant sites (CN) were three and two times, respectively, higher in the feeding assay than in the topical assay (Figures 1, 2). Five concentrations of bifenthrin (Talstar, range 0.003-60 pounds a.i/acre [0.003-67.2 kg a.i./hectare]) and chlorpyrifos (Dursban, range 0.003-15 pounds a.i./acre [0.003-16.8 kg a.i./hectare]) were tested against spring-generation adults from two susceptible (PB, HP) and five resistant (GB, CN, EW, JC, LI) populations. This sprayer system was used in the greenhouse assays. Ten adults were introduced into each pot with P. annua established from seed in pasteurized sandy loam soil mixed with sand. After two hours, treatments were applied using a Generation III Research sprayer at a spray volume of 80 gallons/acre (756 liters/hectare). Treatments were lightly watered in with 0.05 inch (1.3 mm) irrigation. Pots were covered with ventilated lids and left in the greenhouse. After 72 hours, pots were submerged in lukewarm water to extract the adults. Three replications were arranged per treatment. LC50s for formulated bifenthrin and chlorpyrifos were comparable to results obtained in the topical assay with technical-grade active ingredients. Populations HP and PB were highly susceptible. RR50s were the highest for the LI population (503), intermediate for the EW, JC and CN populations (41-63), and lowest for the GB population (7.7). For chlorpyrifos, the LI population had the highest RR50 (28), with RR50s for the other resistant populations ranging from 3.9 to 13 (Figure 3). At the standard field rate of 0.1 pound a.i./acre, bifenthrin provided 60% control of the susceptible PB and HP populations, but only 11% control of the moderately resistant GB population (Figure 3). Even at 3.0 pounds a.i./acre, bifenthrin provided only 42%-53% control of the resistant CN, EW and JC populations and no control of the highly resistant LI population. Chlorpyrifos provided 73%-89% control of the pyrethroid-susceptible PB and HP populations at the standard field rate of 1.0 pound a.i./acre, but was ineffective (3%-14%) against the pyrethroid-resistant populations except for the JC population (48%) (Figure 3). At 6.0 pounds a.i./acre, chlorpyrifos provided 42%-86% control of the pyrethroid-resistant populations. This study expanded the geographic range of confirmed pyrethroid resistance in ABW adults from southern New England (5, 6) to include the New York metropolitan area, New Jersey and eastern Pennsylvania. Moreover, we observed two to three times higher resistance ratios (RR50) and LD50s in the topical assay than had been observed previously (5). The study clearly showed cross-resistance not only within the pyrethroid class, but also to several other chemical classes, albeit at lower levels than for the pyrethroids. Several of the tested insecticides (spinosad, indoxacarb, clothianidin, chlorantraniliprole) had low toxicity against ABW adults in the topical assay. We suspected that the route of exposure is important for, at least, clothianidin and chlorantraniliprole. Clothianidin and chlorantraniliprole have mostly systemic activity and low contact activity, which could explain their low toxicity against ABW adults in the topical assay. However, even in the feeding assays, toxicity was low for clothianidin and indoxacarb and not significant for chlorantraniliprole. These compounds are recommended as larvicides for ABW management. For a better understanding of cross-resistance patterns with these compounds, larval assays should be developed and conducted. The study showed that the resistance levels determined using the topical assay under optimal laboratory conditions were consistent with those made under more realistic conditions in potted grass in the greenhouse with formulated products. In the field, several routes of exposure could contribute to the compound toxicity: through direct exposure to the spray or through feeding on contaminated grass. However, insects could avoid the chemicals or could be sheltered in the thatch, which could lead to either overestimating or underestimating resistance levels. Because the conditions in our greenhouse assays were similar to typical field exposure, the greenhouse assay should be a reliable validation tool. The geographically widespread and often high degree of pyrethroid resistance and especially the cross-resistance patterns observed in this study emphasize the need for rethinking ABW management. The limited number of currently available and effective active ingredients — especially adulticides — suggests that heavy reliance on insecticides, particularly broadcast adulticide applications, is not sustainable. Moreover, the efficacy of several ABW larvicides is also reduced, although to a lesser degree (2). Alternative management strategies, such as cultural control and biological control, need to be further explored and adapted to the high standards of the golf course environment. This research was funded by GCSAA and supporting GCSAA chapters and associations (Connecticut AGCS, GCSA of New Jersey, Greater Pittsburgh GCSA, Hudson Valley GCSA, Long Island GCSA, Metropolitan GCSA, Mountain & Valley GCSA, New Jersey Turfgrass Association, and Pocono Turfgrass Association), the USGA, the New York State Turfgrass Association, the O.J. Noer Research Foundation, the Tri-State Turf Research Foundation, the Rutgers Center for Turfgrass Science, and the USDA National Institute of Food and Agriculture, Hatch Multistate projects 0206130, through the New Jersey Agricultural Experiment Station, Hatch Multistate project NJ08295. This article was based on a paper, “Cross-resistance patterns to insecticides of several chemical classes among Listronotus maculicollis (Coleoptera: Curculionidae) populations with different levels of resistance to pyrethroids,” written by O.S. Kostromytska, S. Wu and A.M. Koppenhöfer and published in 2018 in Journal of Economic Entomology (111:391-398). Topical toxicity assay in the laboratory with technical-grade active ingredients and greenhouse tests with formulated products showed a wide range of pyrethroid resistance levels among adults of ABW populations. Resistance ratios (RR50s) compared with the most susceptible populations were as high as 343 in laboratory tests and 503 in greenhouse tests. Pyrethroid-resistant adults also showed elevated levels of tolerance to insecticides from several other classes, but their resistance levels to pyrethroids were greater. Koppenhöfer, A.M., O.S. Kostromytska and S. Wu. 2018. Pyrethroid-resistance level affects performance of larvicides and adulticides from different insecticide classes in populations of Listronotus maculicollis (Coleoptera: Curculionidae). Journal of Economic Entomology 111:1851-1859. McGraw, B.A., and A.M. Koppenhöfer. 2007. Biology and management of the annual bluegrass weevil, Listronotus maculicollis (Coleoptera: Curculionidae). Pages 335-350. In: M. Pessarakli, ed. Handbook of Turfgrass Management and Physiology. CRC Press, Boca Raton, Fla.
Ramoutar, D., S.R. Alm and R.S. Cowles. 2009. Pyrethroid resistance in populations of Listronotus maculicollis (Coleoptera: Curculionidae) from southern New England golf courses. Journal of Economic Entomology 102:388-392. Ramoutar, D., S.R. Alm and R.S. Cowles. 2009. Pyrethroid resistance mediated by enzyme detoxification in Listronotus maculicollis (Coleoptera: Curculionidae) from Connecticut. Journal of Economic Entomology 102:1203-1208. Olga S. Kostromytska is an Extension assistant professor in the Stockbridge School of Agriculture, University of Massachusetts, Amherst, Mass. Shaohui Wu is a postdoctoral researcher in the Department of Entomology, University of Georgia, Tifton, Ga. Albrecht M. Koppenhöfer is an Extension specialist in the Department of Entomology, Rutgers University, New Brunswick, N.J.